“The Big Sick” (2017). Cast: Kumail Nanjiani, Zoe Kazan, Holly Hunter, Ray Romano, Anupam Kher, Zenobia Shroff, Adeel Akhtar, Shenaz Treasury, Bo Burnham, Aidy Bryant, Kurt Braunohler, Rebecca Naomi Jones, David Alan Grier, Jeremy Shamos, Vella Lovell, Linda Emond, Ed Herbstman, Myra Lucretia Taylor. Director: Michael Showalter. Screenplay: Kumail Nanjiani and Emily V. Gordon. Web site. Trailer. Aspiring comic Kumail Nanjiani (portraying a fictional version of himself) longs to make it big doing stand-up. It’s a fulfilling though difficult path to follow, so, to keep a roof over his head in the meantime, he drives for a ride sharing service. But, when he’s not busy chauffeuring passengers, he spends his nights honing his craft at Chicago comedy clubs with fellow comics Mary (Aidy Bryant), CJ (Bo Burnham) and Chris (Kurt Braunohler), hoping to earn a slot at the prestigious Montreal comedy festival. Stand-up comedian Kumail Nanjiani, portraying a fictional version of himself, seeks to build his career amidst a variety of challenges in the charming yet edgy romantic comedy, “The Big Sick.” Photo by Nicole Rivelli, courtesy of Lionsgate Pictures and Amazon Studios. While doing his routine one evening, he’s playfully heckled by a plucky young woman in the crowd whom he chats up after his set. An almost-instantaneous connection develops between Kumail and Emily (Zoe Kazan), one that leads to a rather unconventional but undeniable romance. But maintaining this fledgling relationship has its challenges, especially since Kumail’s parents (Anupam Kher, Zenobia Shroff) keep trying to set him up in a traditional arranged marriage with a Pakistani wife, a far cry from the all-American girl he’s now dating. To keep matters as simple as possible, Kumail’s intentionally evasive when his family presses him for his views about the many spousal prospects they introduce him to. What’s more, he tells them nothing about Emily, confiding only in his brother (Adeel Akhtar), who urges him to break off the relationship and get with the program. But Kumail feels compelled to follow his own course, despite the potential pitfalls. 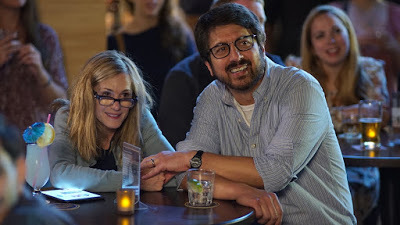 As the couple grows more serious about one another, talk of a more lasting commitment begins to stir, especially when Emily tells Kumail she wants to introduce him to her parents, Beth (Holly Hunter) and Terry (Ray Romano), when they visit from North Carolina. 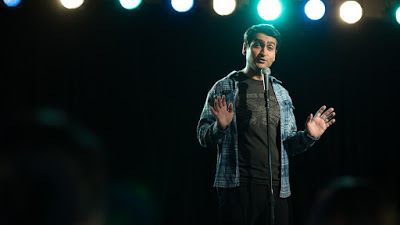 However, when Kumail makes no attempt to reciprocate, Emily grows suspicious, and, when she learns that he hasn’t told them about her, she’s furious. The budding romance quickly comes crashing down in what appears to be a fiery conclusion. Aspiring comic Kumail Nanjiani (left), portraying a fictional version of himself, recounts the story of his own unconventional courtship with his eventual wife, Emily (Zoe Kazan, right), in director Michael Showalter’s new romantic comedy, “The Big Sick.” Photo by Sarah Shatz, courtesy of Lionsgate Pictures and Amazon Studios. Not long thereafter, however, Kumail receives a frantic late night phone call from one of Emily’s friends (Rebecca Naomi Jones), informing him that she’s been hospitalized with a serious but unexplained illness. Given that Emily’s parents have not yet arrived, she asks Kumail to go stay with her in the emergency room. Considering their breakup, he hesitates initially but soon relents, a gesture that Emily rebuffs without hesitation as soon as she sees him. 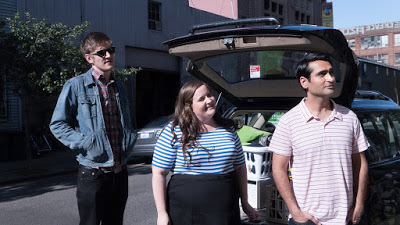 Matters take a quick turn for the worse, however, when Emily’s doctors inform Kumail that her illness is much worse than thought and that she must be placed in a medically induced coma to stabilize her condition. Despite their recent past, he decides to hang in with her, a situation that becomes even more trying when Beth and Terry arrive to meet the man who broke their daughter’s heart. These precarious circumstances thus set the tone for what follows. A number of story strands are left to play out, such as the state of Emily’s health, the future of Kumail’s professional stand-up career, his enduring challenges with his meddling family, and his relationship to a woman and her family with whom he no longer has any seemingly substantive connection. It’s a lot to work out, but it’s also a profoundly meaningful exercise in what it takes to truly become and be oneself. 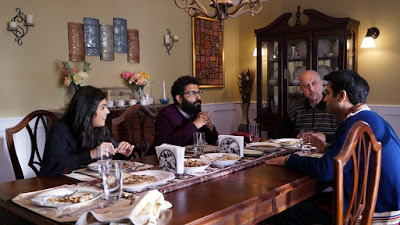 Feeling family pressure to bow to the prospect of an arranged marriage, Pakistani stand-up comic Kumail Nanjiani (right) is routinely cajoled about the idea by his father (Anupam Kher, second from right), brother (Adeel Akhtar, second from left) and sister-in-law (Shenaz Treasury, left) in “The Big Sick.” Photo by Nicole Rivelli, courtesy of Lionsgate Pictures and Amazon Studios. But how exactly does one do this? It all comes down to what we believe about ourselves and what we want, because the beliefs underlying those notions will dictate what results. This is the product of the conscious creation process, the means by which we manifest the reality we experience through the power of our thoughts, beliefs and intents. Of course, the key in this is getting clear about what those beliefs are in the first place. If we’re unsure or conflicted about the nature of our character or what we hope to achieve, we’ll likely wallow in a sea of indecisiveness and lack of focus. In Kumail’s case, for example, should he capitulate to his family’s wishes and marry a Pakistani bride, or should he follow his heart and courageously pursue his relationship with Emily? Likewise, should he stay committed to his dream of becoming a stand-up comedian, or should he give in to his mother’s wishes and become a lawyer? In both instances, only he can decide. But, whatever courses he follows, he needs to put the beliefs in place that make his choices possible. To come up with appropriate beliefs, Kumail must take a number of factors into consideration. First, he must be honest with himself, giving license to his personal sense of integrity. Then he must recognize that he has a choice in the matter, that he’s not limited by what others want for him. Exercising that choice, though, may compel him to face fears and live heroically, overcoming whatever apprehensions that might be holding him back and limiting his options. Should Kumail successfully draw upon these notions, he must then formulate suitable beliefs to manifest the existence he desires. This requires him to look to the input of his intellect and intuition, both of which feed into the belief formation process. Like many of us, he may be tempted to let his intellect dominate, because it’s seen as logical, rational and practical. However, if he relies on it too much, he might well exclude the less tangible, though more heartfelt influences that affect his decision-making process, a scenario that would most likely see him end up as an attorney in a traditional arranged marriage. By contrast, if he gives equal time to the impact of his intuition, he may realize just how much he loves Emily and stand-up comedy, leading him to a relationship and a vocation that give him the genuine satisfaction and fulfillment he seeks. Troubled parents Beth (Holly Hunter, left) and Terry (Ray Romano, right) take a break from worries about their gravely ill daughter by attending a comedy club in the charming but edgy new romantic comedy, “The Big Sick.” Photo by Nicole Rivelli, courtesy of Lionsgate Pictures and Amazon Studios. Much of this might seem like common sense, yet it’s astounding how often we downplay or ignore our true feelings. And, when we do that, the beliefs needed to attain the results we truly want don’t stand a chance. Is that what we really want? If not, we should consider our beliefs carefully, following and adhering to the wisdom of our inner selves. We may truly regret it if we don’t, and “The Big Sick” draws that into sharp focus. This delightful romantic comedy brilliantly breathes new life into a genre that has grown progressively tiresome and stale. Based on the protagonist’s own unusual courtship experience, the film takes chances (and succeeds beautifully) that movies of this ilk are seldom willing to do. Despite a slight tendency to drag a bit in the final 30 minutes, this fresh, lively offering features fine performances all around (especially by Hunter and Romano in strong supporting roles) and raucously funny bits not typical of rom-coms. Anyone who’s ever had experiences with an unconventional relationship or the challenges of staking one’s own ground will certainly appreciate the wit and wisdom of this offering, as will those looking for something more out of the tried-and-true romantic comedy format. It’s been said that those nearing the end of their lives often have more regrets about the things they didn’t do than the things that they did. Kumail’s experience shows us what it means to perch on the precipice of decision and indecision. For his sake, let’s hope he comes away from his dilemma on the right side of the fence. Aspiring stand-up comedian Kumail Nanjiani (right) and fellow comics CJ (Bo Burnham, left) and Mary (Aidy Bryant, center) seek their fortunes in director Michael Showalter’s new romantic comedy, “The Big Sick.” Photo by Nicole Rivelli, courtesy of Lionsgate Pictures and Amazon Studios.